Mount Laurel, NJ / April 9 — Brandywine Living is proud to announce recognition of the new signature program, Chop House, through the Senior Dining Association. 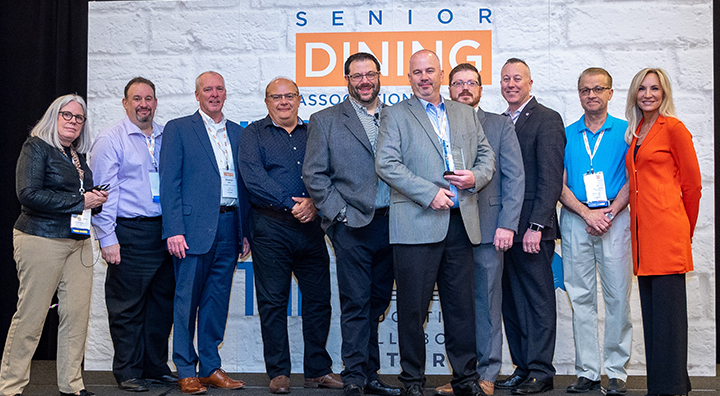 As the industry’s first organization focused on senior housing dining, The Senior Dining Association’s awards program ensures that the very best in the industry receive recognition among their peers and sets a standard to aspire to. The SDA’s award ceremony was held in Charlotte, SC on March 19, 2019. Brandywine Living’s Chop House, created by Sean Keating, Director of Culinary Innovation, was created in response to growing trends to provide authentic dining experiences in senior living. This monthly dining experience converts the dining room into an upscale steak house where all items are made to order in white glove style. The four-course dining experience starts with a soup or salad, followed by the main course. Entrée options include steak house favorites such as T-bone steak, filet mignon, and strip steak complete with choice of gourmet glaze and traditional sides. The last course features rich and decadent desserts such as banana foster cheesecake. Besides enhanced resident satisfaction, other positive factors of the dining experience include elimination of food waste due to cook-to-order experience and an added competitive marketing edge. The Chop House has shown to have a direct influence on potential residents who value innovative dining options and expanded choices. In the wake of its success at Brandywine Living at Alexandria, Sean Keating plans to implement the program across all twenty-nine operating Brandywine Living communities. “Creating something that makes others stop and say, ‘hmmm’, is my goal here at Brandywine Living. Not only for the benefit of our residents but also to set a high standard on how the world views senior dining,” commented Sean Keating. Brandywine Living looks forward to continuing to be a key contributor to dinning innovations in the senior housing industry.